First of all, there are several species of flea, and the species we’ll be primarily concerned with in this article is the common cat flea (Ctenocephalides felis). The cat flea will bite cats, dogs, and humans while looking for a delicious blood meal. While there isn’t an easy way to identify the difference between a cat flea and a dog flea (C. canis) or a human flea (Pulex irritans), the latter two are far less common than the cat flea. So for the purpose of keeping this article short we’ll focus mainly on the life cycle, behavior, and control of the cat flea. 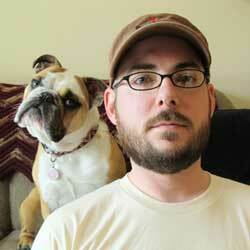 Getting rid of dog fleas and getting rid of human fleas are entirely different subjects. Contrary to popular belief, fleas spend a considerable amount of time hiding in your pet’s bedding, your carpets, or pretty much anywhere they can find suitable shelter. They lay their eggs which then turn into larvae, who then feed on the excrement of the adult fleas and other organic material like your pet’s dander (dead skin). Once the larvae has fed enough, it forms into a pupa which takes around two or three weeks to become an adult flea. Temperatures between 65 and 80 degrees F and higher relative humidity (75%+) will speed up the flea’s life cycle considerably, allowing an adult female cat flea to lay about 20-25 eggs a day (800+ in a typical female flea’s adult life). Knowing these facts makes it easier to know why traditional methods work to get rid of fleas. 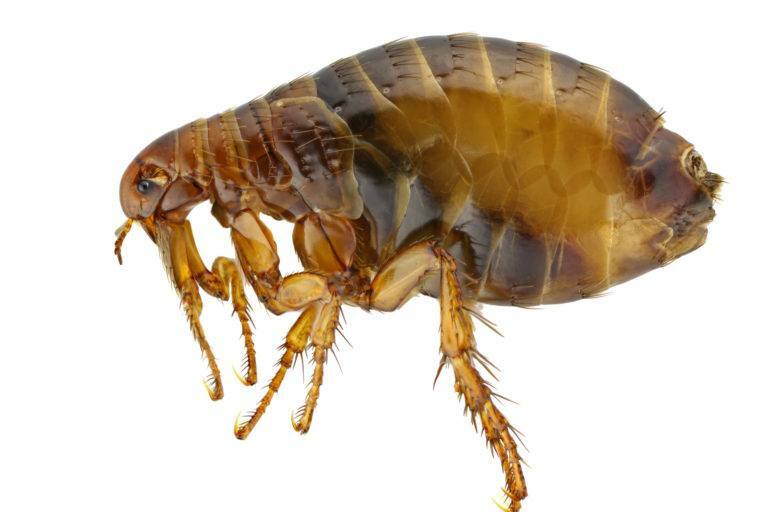 Flea populations as a whole are notoriously hard to get rid of because fleas are really only susceptible to insecticides when they are either an adult or a larvae, unless you’re using a product that contains both limonene and linalool. In general, you have 5 common insecticides that kill fleas: pyrethrin, carbaryl, limonene, linalool, and malathion. Flea sprays, dips, and dusts containing pyrethrin, carbaryl, and limonene, will kill adult fleas and flea larvae. Flea shampoos and sprays that contain both limonene and linalool will kill fleas in all stages of their development, including the eggs. Flea carpet and furniture treatments that contain malathion (an insect growth regulator) will halt the growth beyond the pupal stage of any flea—thus making it the best way to follow up a good cleaning and flea dip. The first treatment you will want to try to get rid of fleas immediately is a bath in soap and water. Soap in lukewarm water acts as an insecticide, actually. In fact, they are technically referred to within the gardening and pest control industries as “insecticidal soaps.” Some people have come to believe (for whatever reason) that bathing your pet as a means of flea control is ineffective. This isn’t true; the fatty acids in soaps will kill fleas just as fast as any synthetic insecticide. However, you should not rely entirely on baths to control fleas, especially if you’re dealing with puppies and kittens. Flea dips are your next step to get rid of fleas after a bath in soap and warm water. Many dips use an active ingredient called pyrethrins. Pyrethrins are the active ingredient found in the natural insecticide, Pyrethrum. Pyrethrins are only different because they an extract, or a concentrated form of pyrethrum. They are considered one of the most effective and least toxic insecticides on the market, which explains their extensive use in pet flea control products, with the exception of flea products for cats; cats are extremely sensitive to pyrethrins. Pyrethrin-based flea dips, on the other hand, are also convenient because they quickly cover the entire pet. Adam’s makes a good Pyrethrin-based flea dip. If a flea dip isn’t effective at getting rid of fleas or you prefer not to use pyrethrins, you may want to consider a linalool/d-limonene spray. Linalool and d-limonene are extracts from citrus peels, and they happen to be very effective insecticidal flea treatments. They are mostly sold in sprays, and as I mentioned in the sidebar to the left, products that contain both linalool and d-limonene will kill fleas in all stages of development, including the eggs. These sprays should be applied to the whole animal, but try to keep it out of their eyes, nose, and mouth. You may also use linalool/d-limonene products as bedding treatments to kill any larva, pupa, eggs, or adult fleas hiding in your pet’s bedding. Carbaryl and Malathion dusts are just as effective at getting rid of fleas as flea sprays are. Carbaryl is actually the insecticide of choice when treating cats for fleas because cats tend to be less sensitive to Carbaryl-based products. You can also purchase carbaryl, sold most commonly as Sevin, from a garden supply store on the cheap. Malathion can be purchased the same way, but malathion doesn’t kill adult fleas like carbaryl, pyrethrins or limonene. Malathion is a insect growth inhibitor, which stops fleas from either reaching the pupal stage or developing beyond it. Make sure to brush your pet well—clipping any matted hair during the process—before working the dust into the coat as thoroughly as possible. An absorptive dust like food grade diatomaceous earth would be your final follow up treatment to both kill fleas and prevent recurrent infestations. Diatomaceous earth in powder form is a natural micro-abrasive dust that actually scratches the exoskeleton/outer cuticles of the flea, which results in the dehydration and eventual death of the flea. In fact, once this dust is worked into the coat of your pet, you may notice fleas stumbling out from beneath the fur and dying right there in front of you just like they deserve. Diatomaceous earth is an amazingly safe and effective flea control dust that can be purchased cheaply from almost any gardening supply store. It may also be used to dust your pet’s bedding to kill fleas and prevent fleas from taking refuge there again. You can get a 10 lb bag of diatomaceous earth from Amazon for a decent price. What you need to take into consideration when choosing the right flea control treatment is the type of pet and your pet’s age. Puppies and kittens should not be given dips or oral flea treatment medicine without first consulting your veterinarian. Most of these treatments are not registered for use on pets less than 4 months old. Below are some very basic rules for deciding which flea treatment is best for your pet. If you’re still not sure about these treatments, check with your vet! If you have a puppy or a kitten less than two months old, I strongly encourage you to see a veterinarian immediately because of the risks associated with flea infestations in very young pets. If you have a puppy or kitten that is three months or older, it’s a good idea to use a flea spray or powder that is labeled for use on puppies or kittens of a certain weight. Advantage flea control products are an excellent name brand that labels all of their products with a weight threshold, allowing you to choose the right strength for your pet. The same goes for Frontline Flea control products, which are labeled for 2 puppies and kittens two months or older. If you have an adult cat, you will want to stay away from any oral flea treatment. None are registered for use with cats. If your cat is good about dips and baths (most are not), you can try bathing them with a carbaryl-based flea control product. If your cat is not good about baths, then a carbaryl-based (Sevin) flea powder or a Fipronil-based flea spray are your next best choices. If you have an adult dog, most any flea dip will do the trick. Dogs are less sensitive (in most cases) to insecticides than cats, so any product based on pyrethrins, carbaryl, or even pyrethroids should do the trick. Just make sure you shampoo your dog with an non-medicated soap before applying a flea shampoo. Stay away from flea collars. They’re ineffective and dangerous. Insecticidal Soaps are an immediate form of natural flea control. Insecticidal soaps take advantage of the natural insecticidal properties of the fats used to make soap. When these fats are refined and made into insecticidal soaps, they provide an effective way to control arthropods like mites, ticks, and fleas without the use of harmful poisons. Pyrethrum is another form of immediate natural flea control, and is considered to be one of the safest natural insecticides for pets and humans. Made from the crushed flowers of pyrethrum chrysanthemums, pyrethrum powder is worked into the coat of your pet just like any other flea powder, killing most adult fleas that come into contact with your pet. Wear a dust mask and try not to get it into your pet’s mouth, eyes, or nose. Natural Animal is the brand shown above. Vacuuming and steam cleaning are great ways to follow up an immediate form of flea control like powders and soaps. Vacuuming helps to pick up some eggs and most adult fleas present in your carpet; however, flea larvae naturally grasp at anything when they sense vibrations from vacuums. This is why you should follow up a vacuuming with a steam cleaning or rug shampoo. Steam will kill any remaining eggs, larvae, pupae, and adult fleas on contact. Comb fleas out of your pet’s coat with a flea comb and a bowl of soapy water nearby to kill the fleas when you snag them with the comb. Because complete flea control is considered almost impossible, combing for fleas remains the most satisfactory way to both get rid of fleas and monitor the flea population. If you notice a spike in the number of fleas you’ve captured and killed, you know it’s time to step-up your flea control regiment. Comb for fleas once every week or two weeks. You can get pet flea combs at Amazon.